The Kenneth P. LaValle Stadium turf was slick, coated with 35-degree rainwater. The flags in the corner ripped with fierceness through the gale, their ropes taut. The Colorado women’s lacrosse team wore black leggings and sleeves, 1,800 miles from sunny Boulder. The No. 5 Seawolves defeated the No. 4 Buffaloes, 10-6, to render the road team its first loss of the season. Throughout the practice week, Stony Brook head coach Joe Spallina had his staff soak the players’ stick shafts with cold water to simulate the inclement conditions, similar to NFL quarterbacks practicing with drenched footballs. On offense, a familiar, familial tandem led the way for the Seawolves. Junior attacker Kylie Ohlmiller scored three goals and two assists — for an NCAA-best 70 points this season — while her sister, freshman attacker Taryn Ohlmiller, had a pair of goals and four assists. “I think Kylie’s the best player in the country, and I think Taryn’s the best freshman in the country,” Spallina said. The pair put on a show. In the first half, Kylie Ohlmiller dove through the splashing water for a disallowed, hockey-style goal. Later she made the game 9-6, falling to her right with a defender piggy-backed on her. Taryn scored one behind her back, a play that has become a staple of her older sister’s repertoire. The Seawolves entered halftime with a 6-2 lead, then the margin tightened. The Buffaloes scored four of five goals to cut the advantage to 7-6 with 14:56 left in the game, when Spallina called timeout to settle his team. Stony Brook locked Colorado down for the rest of the game, scoring the final three goals of the contest. In the game, the Seawolves forced 26 turnovers and beat the Buffaloes 20-8 on ground balls. On Sunday, the Seawolves won again — their sixth in a row — by a score of 18-11 over America East Conference rival Albany. “I wouldn’t say it was a trap game for us, but it was a tricky game” Spallina said. Stony Brook asserted its presence early, with the team’s first goal just 33 seconds into the game. Sophomore attacker Keri McCarthy received a feed from senior midfielder Dorian Van Dyke and gave the Seawolves an early 1-0 lead. McCarthy’s fingerprints were all over the game. Her dominant performance in the draw control department — including eight controls herself — allowed the offense to have its way. Stony Brook continued this strong start, jumping out to a 5-1 lead within the first eight minutes of play. Albany struggled to keep pace with the Seawolves scoring barrage. Spallina noted that a quick start was an emphasis in pre-game walkthroughs. McCarthy’s strong game was painfully rewarded with an inadvertent shoulder to the nose during a struggle for one first-half draw control. McCarthy was briefly forced out of the game due to the blood. The rivalry game status was verified by the brutal number of fouls during the game: a combined 43. For Stony Brook’s juggernaut offense it was a collaborative effort in which five different players registered hat tricks. The Seawolves were led by Taryn Ohlmiller who registered eight points on the afternoon. One of those who registered a hat trick was midfielder Dorrien Van Dyke. “You circle the Albany game on the calendar, and you want to beat them,” she said. 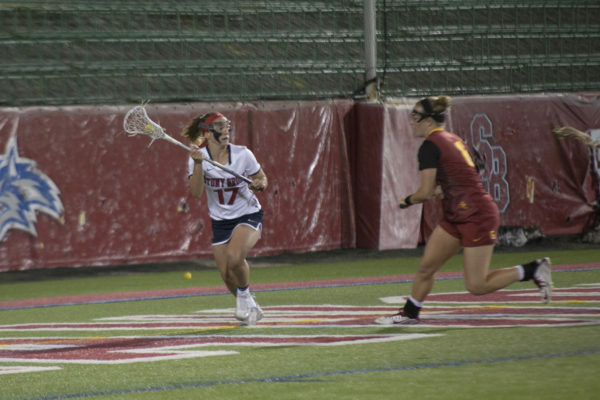 Junior attacker Kylie Ohlmiller tallied another ridiculous goal for the Seawolves in the second half on Sunday, scoring behind her back while falling forward, hitting the top corner opposite of her body’s momentum. With Sunday’s win, barring a disastrous loss to one of the league bottom-dwellers, Stony Brook will remain atop the conference for the remainder of the season. The Stony Brook women will resume action next Saturday at home against conference opponent Binghamton at 2 p.m.